The resurrection of Peru’s popular restaurant and lodge— yes, Johnny Seesaw’s is back! Take heart: it is definitely going to be, as the great Y.B. 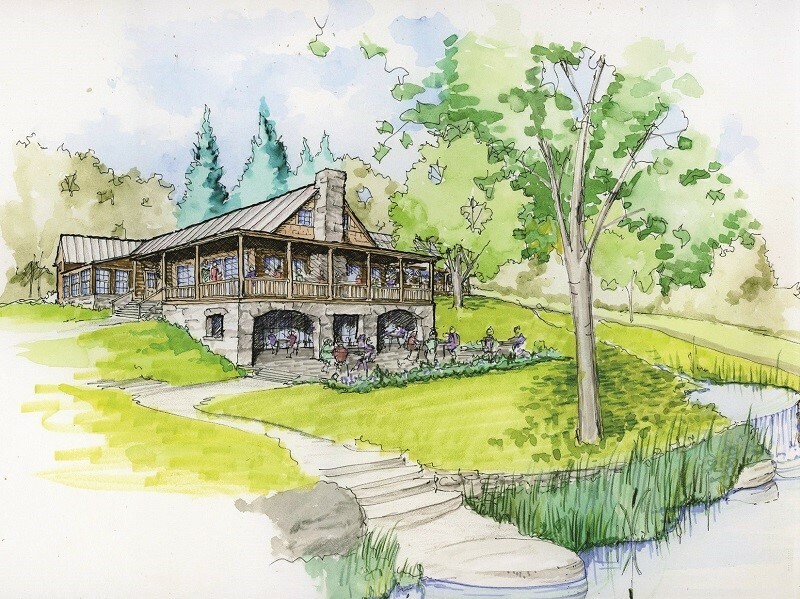 once said, “…déjà vu all over again.” Are you going to see that great wide porch overlooking the valley and faraway ridgelines? Check. That cozy stone hearth that warmed everyone at the entrance? Check. Those little brass plaques on the wall commemorating everyone’s Seesaw birthday party or wedding or family reunion? Check. That round, copper clad fireplace in the middle of the dining room? Check. 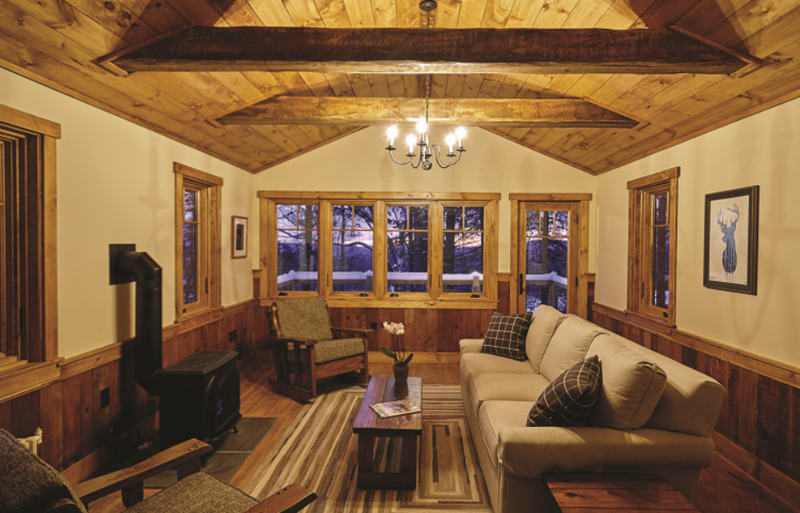 Those handsome hand-hewn beams and that beautifully carved woodwork? Check. That odd little nook and striking mural along the wall, a niche that was called, oddly enough, the “seducerie”? Check. That incredibly fabulous bar with those bartenders who without a doubt loved being bartenders? Check. And, last of all—the one world-famous thing that everyone who’s ever been there wants to see back again at Johnny Seesaw’s—that prime rib dinner? Triple check. Slated to open to diners and overnight guests this summer, the current owners are well aware that the restaurant and bar had a grand, even international reputation among locals and visitors alike—a standing he simply cannot fail to match. Seesaw’s has been a landmark and so much more since it first opened in 1924, and each successive owner did exactly what the newest proprietors have done: kept pretty much everything everyone loved about the old Seesaw’s, and layered on a bit of a new twist. The three separate guest cabins are called Chicken, Butterfly and Court. The extent of the new construction means that the 2008 National Register listing will be withdrawn. To those who swear by authenticity and nothing less, it is somewhat wrenching that the historic log building, and its many quirky later additions, had to be dismantled. By the time that happened though, the best and most treasured parts of the main dining room and bar had been labeled, numbered, removed, and saved to be reassembled in the new building, which sits just a few feet away from the original. (It’s where the swimming pool used to be.) The new Johnny Seesaw’s restaurant has a similar footprint, but this time, it has an actual foundation below it, and acres of brilliantly engineered site work surrounding it involving massive subterranean culverts. In the old days, the happy people sipping their cocktails at the bar likely never suspected that the footings of the structure that Seesaw built actually sat in the dirt, and that millions of gallons of snowmelt and rainwater, cascading off the mountainside and overflowing from the ponds and streams above, flowed directly underneath the floor, mere inches below the soles of their shoes. How the whole pile of logs never floated off like an ark all the way down onto the road below, no one knows. 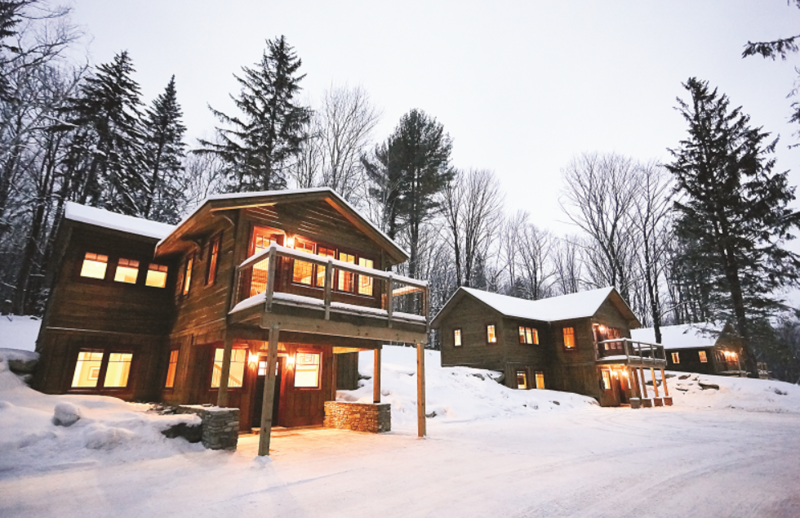 Seesaw’s Lodge is a combination of accommodations for 35 guests or so in three different cabins (each about 1,800 square feet) and a big lodge building. The way it has been designed, there are countless options for individuals, couples, families, or larger groups to spend their time in private or together, as they wish. Prins’s personal tour of the guest rooms in the lodge, the enormous wood-frame house at the very top of the property, goes something like this: “This is the Black Walnut Room, this is the Cherry Room, this is the Oak Room, this is the Birch Room…”. The woodworking, furniture, and the theme throughout are inspired by the trees that grow in Vermont’s forests and directly outside the windows of some of the rooms with those names. The décor in the guest rooms and in the common areas is that clean, comfortable style that some describe as American rustic. The spaces are airy, bright, and fresh, and, if anything, it’s a style best described as Vermont chic—there are plush sectional sofas; queen and king-size beds piled high with layers of comforters and lots of pillows; soft rugs underfoot; super-fluffy towels; deep bathtubs; original works of art on the walls; large windows that capture every view; and fireplaces everywhere. Each guest room is entirely different, and every repeat patron will certainly want their one favorite room or cabin time after time, and nothing else. Some may never leave, because staying at Seesaw’s Lodge feels so much like being at home. Each of the renovated three guest cabins have “secret” details and re-purposed building elements. True to his desire for keeping the past memories and the historic value of Seesaw’s ever present, Prins calls the smartly appointed, kitchen-equipped cabins by their original names, as listed in the National Register of Historic Places. They are The Chicken Cabin (because at one time it really was for chickens); The Butterfly Cabin (because it once had a double-winged sloping roof); and The Court Cabin (because it overlooked the 1941 tennis court). Johnny Seesaw’s, established in 1924 as a dance hall, and later operating as a restaurant and lodging venue, is not just another once popular eatery that happened to land in the National Register of Historic Places. In fact, for the past decade, the whole hillside on VT Route 11 in Peru had been its own little historic district, with a cluster of nine buildings included in the designation. And, officially, that’s what it was called: Johnny Seesaw’s Historic District. It’s not a rumor anymore. It’s absolutely, deliciously true. Seesaw’s is coming back, reborn from the ruins left forsaken by the roadside since the long-famous hangout served its last supper several years ago. Who was Johnny Seesaw? And what the heck is an izba? Ivan Sesow was the builder of the log house that later became the long-famous local hangout known as Johnny Seesaw’s in Peru, Vermont. 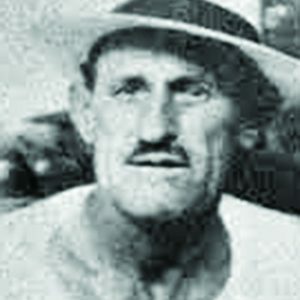 Sesow was born and named Kyrill Sessofin Werkali in Minsk, Russia in 1887. You’d be surprised how often these typically dry NR files offer up spicy little tidbits. But, there’s more! Vinna, called “Vinnie,” was a Vermonter, born in Bondville, and she was only 14 years old on her wedding day in Wilmington, Vermont. She had fudged the truth a wee bit, as did he. Their marriage certificate states that it was Sesow’s first marriage—had he forgotten to mention poor Mary? Sesow and his second wife bought the property in Peru for $1, according to the town records, and took a $125 mortgage on it to build a house. In 1924, using only hand tools, he himself constructed a building, perhaps feeling nostalgic for the motherland, in the vernacular style of rural Russia—an izba. An izba is a farmhouse made of axe-hewn logs, and a common feature of all izbas, even those dating back 600 years or so, is a huge central fireplace or stove used for heating and cooking, and as a warm place to dry clothing or to sleep. It typically took up about one-fourth of the space inside these rustic dwellings. Sesow embellished the izba in the traditional fashion, adding decorative wooden panels that he carved himself. 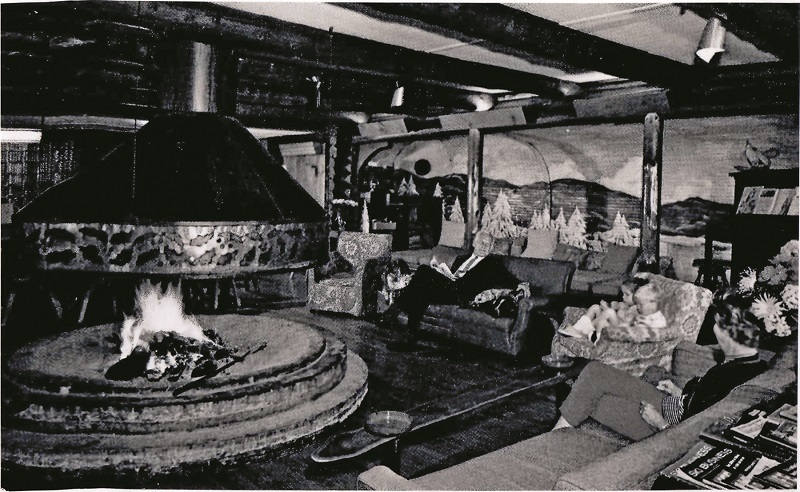 Après-ski by the round copper hearth in a vintage Johnny Seesaw’s photo. 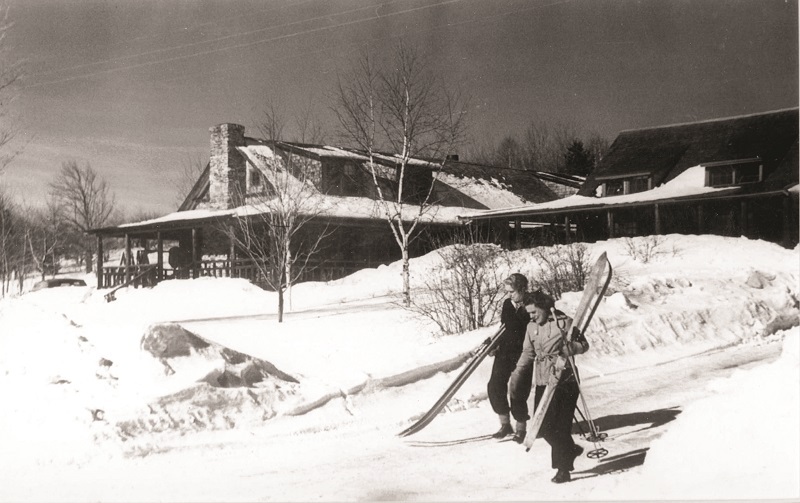 • The Johnny Seesaw property, 6.8 acres, was designated a National Historic District in 2008 because the business was a significant attraction at the dawn of the ski industry in Southern Vermont. 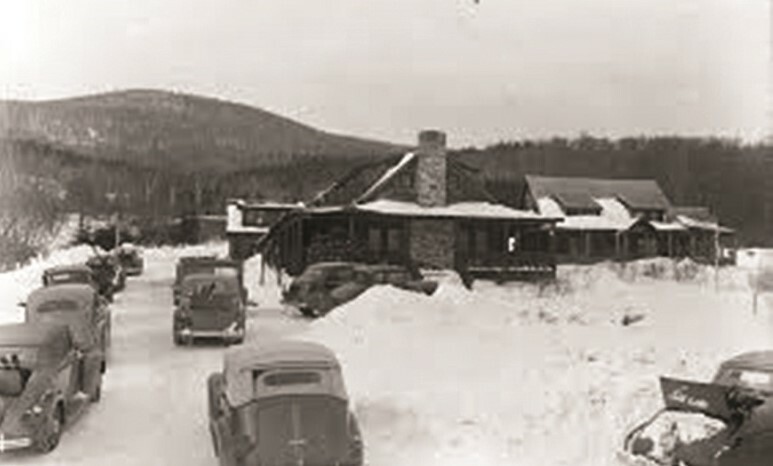 Offering food, drink, entertainment, and accommodations, it served as a lodge as early as 1938 for skiers on nearby Bromley Mountain, which opened its first trail, the “Bromley Run,” two years prior. • It is said that Seesaw’s was where some of its regular customers in the late ’30s cooked up a plan to launch the National Ski Patrol System, and among them was the organization’s first president Charles Minot “Minnie” Dole. • Plus, you get extra points if you know this bit of national trivia about Seesaw’s: it claims to be the place where the idea was born to form the U.S. Army Tenth Mountain Division (ski troops specially trained for winter combat in alpine conditions), again thanks to Dole who lobbied the U.S. War Department for it in ’39. • As a place of employment, and as a popular and enduring hospitality venue, Johnny Seesaw’s played an important part in growing and sustaining the local and regional tourism economy.